Atotech’s horizontal equipment is the solution of choice for modified Semi-Additive Process (mSAP) technology. This wet-to-wet solution is designed to produce outstanding reliable interconnects at a very high throughput while minimizing handling and operating needs in the process from desmear and electroless copper to flash plating. Atotech’s system incorporates innovations that allow significant savings of water and energy and at the same extend the life time of chemistry. Atotech’s system utilizes Securiganth® E series for desmear, Printoganth® U Plus for PTH and Inpulse® 2HFU for electrolytic copper plating to achieve superior throwing power and uniformity. For finer line and space requirements our Uniplate platform provides several universal transport systems (with UTS-xs down to panel thickness of 40µm+2×2µm copper clad). In addition, we are able to offer solutions for the avoidance of particles and a sophisticated filtration package for fineline structures. Demanding PCB designs and complex configurations are driving the need for improved reliability and overall efficiency. At the same time more complex production methods such as mSAP are proliferating. 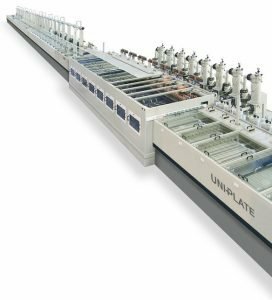 Atotech’s Uniplate PLBCu6 can be deployed for inline processing of desmear, electroless copper and flash copper plating. The wet to wet process reduces handling needs and the risk for contamination. Well known for its superior throwing power and uniformity, it saves water and chemistry measurably – helping customers meet their sustainability goals.